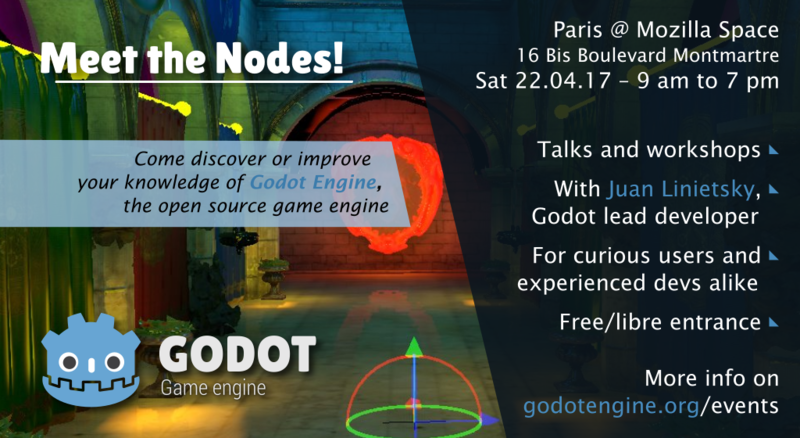 Get ready to Meet the Nodes in person: we are organising a Godot event on Saturday 22 April 2017 in Paris, where many Godot developers will be giving talks, lead workshops or just be available to discuss the engine and game development! It's worth noting that our lead dev Juan Linietsky (reduz) will be present too, which is a great opportunity for our European community to finally meet him in person. The event will be hosted by Mozilla at their Paris Space (16 Bis Boulevard Montmartre, Paris 75009, France), starting at 9 am and running up to 7 pm. There is no entrance fee, but to ease the organisation we'd like you to fill this form if you plan to join us, so that we know how many people to expect. See our events page for up-to-date information about the event. The detailed schedule will be announced in the coming weeks, but you can already be sure that we will make this event interesting for both curious beginners and advanced Godot users - so even if you've never heard of Godot before landing on this blog post, do not hesitate to join us to discover this awesome free and open source game engine and its community! This event will be partly talks and partly workshop, and we will set up the space so that everyone can sit at a table and have access to a power socket - so don't hesitate to bring your laptop so that you can discover Godot directly by testing it, or do more advanced stuff with fellow community members if you are already familiar with the engine. We would like to invite Godot users and contributors, as well as developers working on game development related topics (e.g. WebAssembly) to propose talks that they could give during the event. The expected talk duration would likely be 20 min plus 10 min Q&A, but feel free to propose something else that you think would be more fitting, we will be relatively flexible. The Mozilla Space is fully equiped with everything we could likely wish for, including a video projector, audio setup, recording and streaming setup. If you would have more specific needs though, feel free to tell us about it and we will see what is possible. Looking forward to interesting talk proposals!